Now that zucchini season is in full swing, its time to take advantage of how cheap and tasty these veggies are right now. 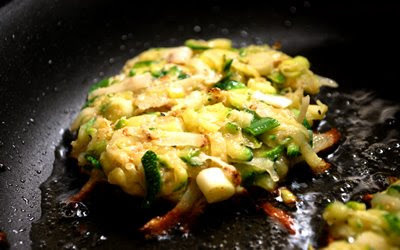 Enter zucchini-based pancakes. 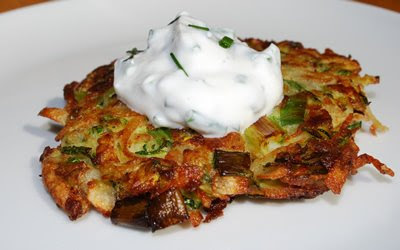 They’re a lot like the traditional potato latke, but using zucchini along with the potato gives them more interest, particularly when you also toss in a hefty portion of scallions to boot. These make a great side dish, or if the summer heat has zapped your appetite, make a lovely light supper all on their own. 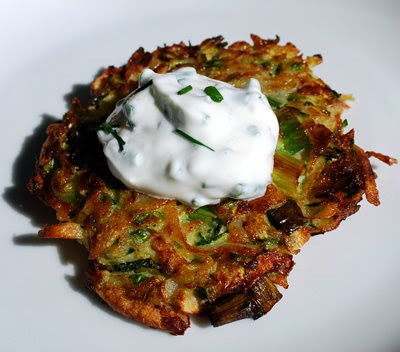 It you know latkes, you’ll probably figure out without me telling you that these can also be paired with applesauce instead of the sour cream and chives, or even with both if that’s how you happen to roll. 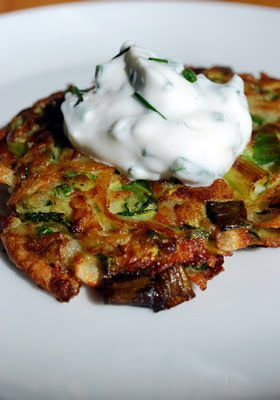 But sour cream and chives are a classic combination for good reason, and that’s how we prefer to serve these crisp yet tender golden brown and green pancakes. Clean and scrub, but do not peel, the potato and zucchini. 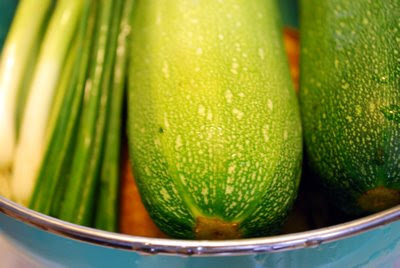 Using a box grater, grate potato and zucchini into a colander and toss with a teaspoon of salt. Let sit for about 10 minutes, then scoop up about a handful into a clean dishcloth. Wring out over the sink. Place dried grated vegetables into a large bowl. Repeat, switching to a clean dry dishtowel if need be, until you’ve dried all the grated vegetables. You want the potato and zucchini to be pretty dry at this point. Slice the scallions into ¼ inch slices, and add to grated veggies in bowl. Add the flour, beaten eggs, and pepper to taste and stir to combine. Add in a few extra dashes of salt if you like. Chop chives and combine with sour cream in a separate bowl. Heat 1 tablespoon of oil in non-stick skillet over medium heat. Pick up about a handful of veggie mixture, and shape into a ball in your palm. Smoosh it into a cake by flattening it with your other hand, and add to skillet. Repeat until you fill the pan, making sure not to crowd your pancakes. Cook about 3 minutes, until the bottoms are golden, and the cakes have set, being careful not to burn the bottoms. Then flip ‘em over, and continue cooking approx. another 2-3 minutes. Remove to a plate lined with a paper towel. Adding more oil to the pan as needed, repeat until all the pancakes are cooked. If not serving immediately, these keep very well in a warm oven. Serve topped with dollops of sour cream and chives. drive the cost down even further, as regular flour is less expensive than whole wheat. ** I’d recommend using canola for this, if you have it. Healthwise, its pretty analagous to olive oil and a good deal cheaper. This is a great recipe for the dog days of summer, when tomato and corn are at the ripest and the mere thought of having the stove on for more than a few minutes makes you want to whimper. As you can probably tell from the ingredient lists, this is one of those recipes that you’re only going to want to make when you can get burstingly fresh produce. I like this best with extremely young kernels that are pale and tiny. 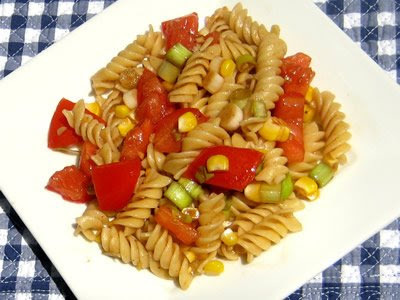 We prefer rotini or rotelle for this dish as the tiny corn kernels get caught in the grooves of the pasta. Serve hot or at room temperature. remove any remaining silks and clean the cobs well, trimming if needed. When the water comes to a boil, add rotini and set a timer for five minutes. After 5 minutes, add the corn. After approx. 3 more minutes, both the corn and rotini should be done. Keep an eye on the corn though: if your ear is especially young and tender, use tongs to pull it out early if needed. Meanwhile, whisk together olive oil, vinegar and salt and pepper to taste if a large bowl. Mince garlic, add and stir. Chop and seed the tomatoes and thinly slice the white and pale green parts of the scallions. * Stir to combine. 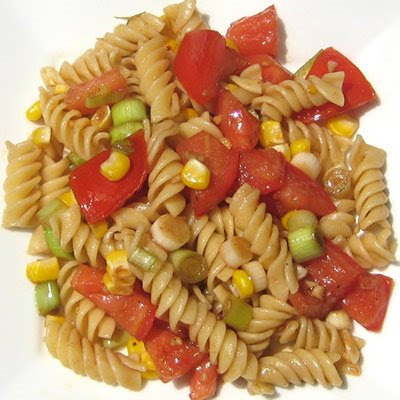 Once rotini and corn are cooked, drain and add the pasta to tomato mixture in the bowl. Remove the corn from the cob by standing it upright on a cutting board, holding on to the cob with a towel as it will be hot, and slice off the kernels by running your knife vertically down the cob. Add the corn kernels to the pasta and tomato mixture, and toss well. * Save the tougher dark green ends for making stock!